Hi everyone. Summer is coming to a close and that means lots of outdoor activities and parties for the Labor Day weekend. 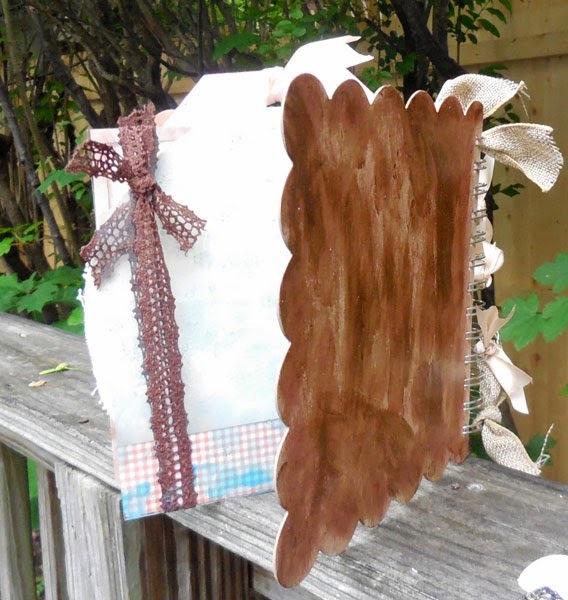 This project is on the Clearsnap blog today. 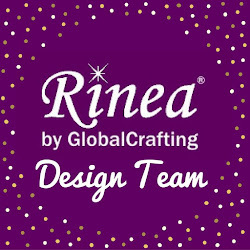 There is nothing better than creating a party themed ensemble to display at your home or better yet, create one for a party and take it with you. I think the hostess would be thrilled to get this ensemble. I found this red plastic bucket at a local store and thought it would be fun to decorate. 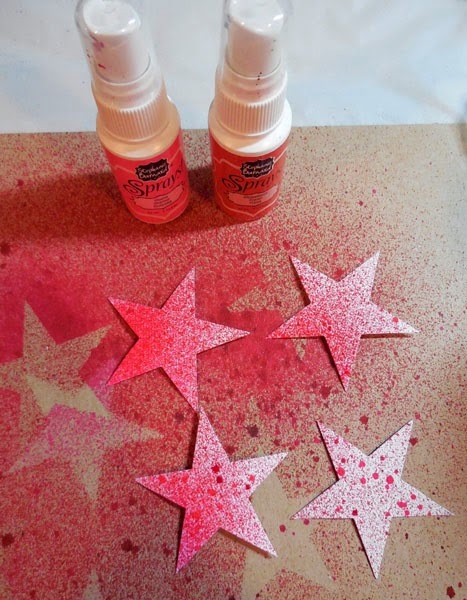 I die cut an assortment of different sized stars from white cardstock, spritzing the largest with Stephanie Barnard Sprays in Sky and Blueberry and the medium sized stars with Guava and Strawberry. Once dried (this took awhile since I sprayed quite heavily!! ), I used the Say What? 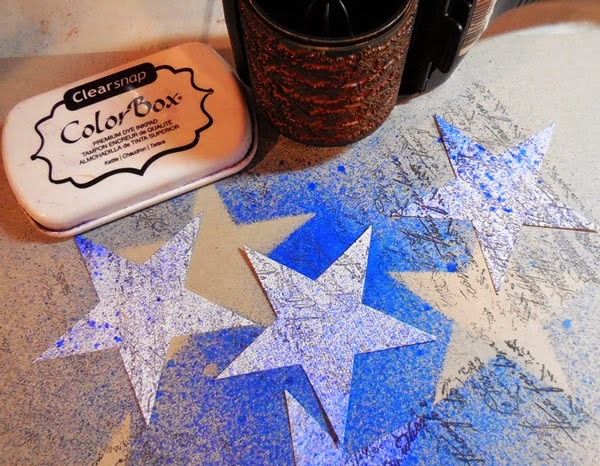 Rollagraph Wheel using ColorBox Kettle Dye Ink to create dimension on the stars. 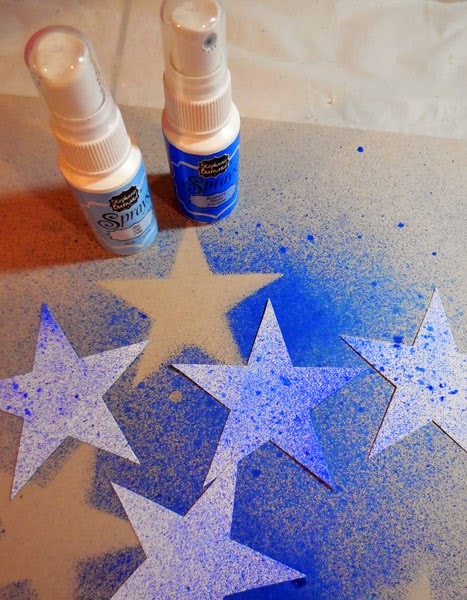 The edges of the stars were also inked with Kettle Dye Ink using an Art Dauber - so easy to get into the tiny spaces! 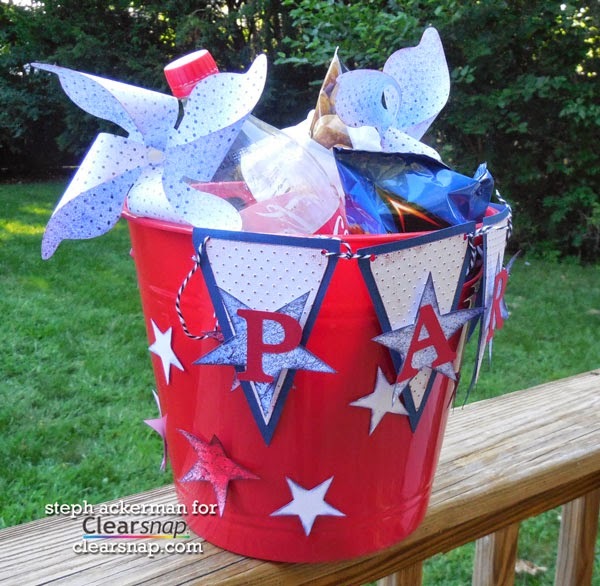 Then I just randomly added the red and white stars around the bucket with Glue Dots. The banner was die cut from 2 layers of cardstock. 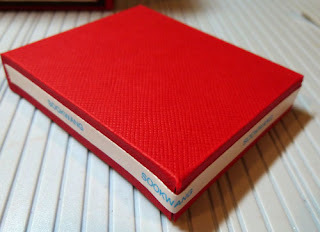 The white layer was then embossed with an embossing folder to add just a little bit of dimension. In keeping with the red, white and blue theme, I inked the edges of the white layer as well as the embossed areas with Graphic45 Decades Ink in Triumphant Red - a dye ink that dries very quickly (I was quite impatient by this time!). Once all the layers were ready, they were assembled together with twine. 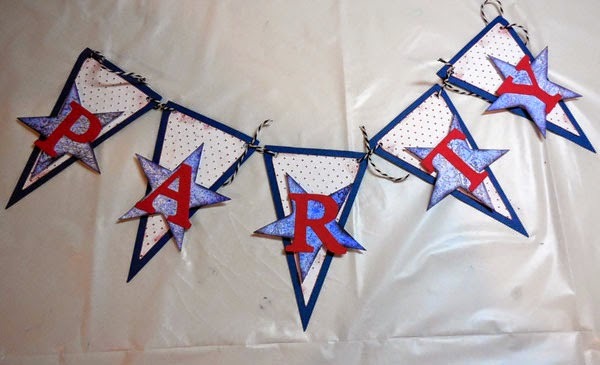 The blue stars were added to the banners then red letters were placed on top. 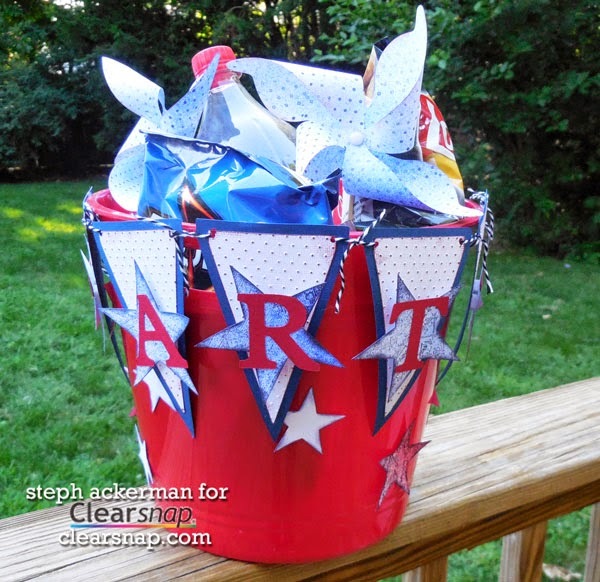 Add strips of Glue Dots around the rim of the bucket and adhere the banner to the bucket. 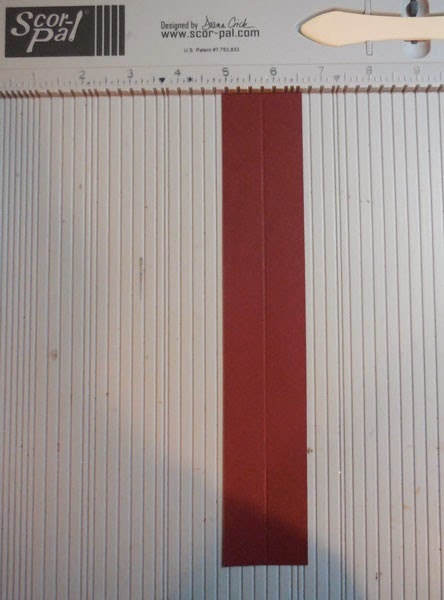 The banner can then be removed and hung separately if so desired. 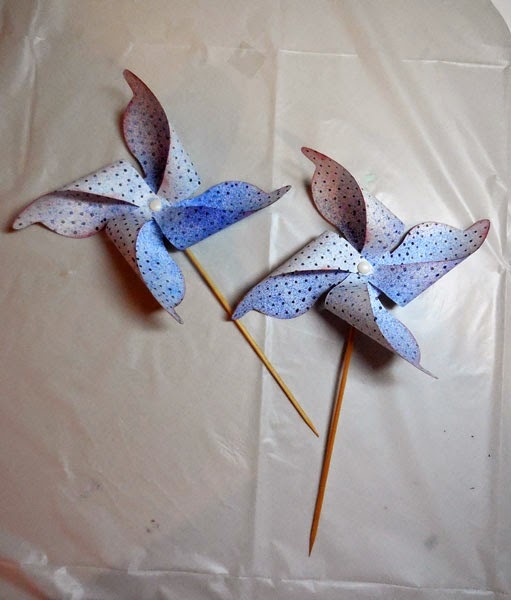 And just because, I created pinwheels from white cardstock, then spritzed them with Stephanie Barnard Sprays in Sky and Blueberry. 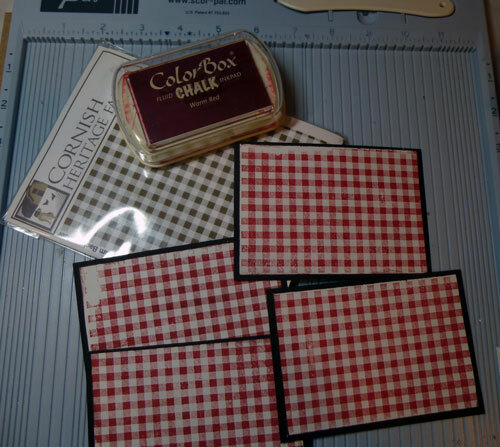 I used the Dots Rollagraph Wheel and ColorBox Kettle Dye Ink and then inked the edges of the pinwheels with Graphic45 Decades Ink in Triumphant Red using an Art Dauber. Easy to assemble with large brad and then I adhere them to skewers with Glue Dots. 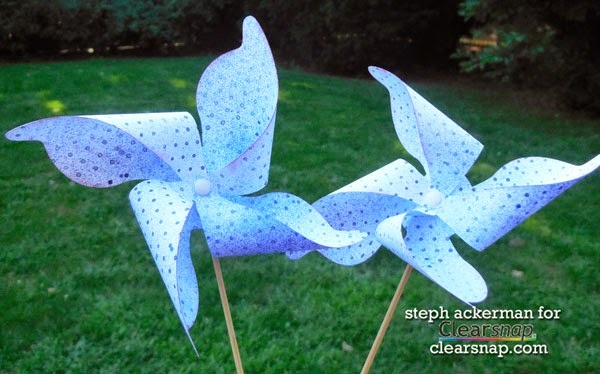 Very easy to do and so much fun! 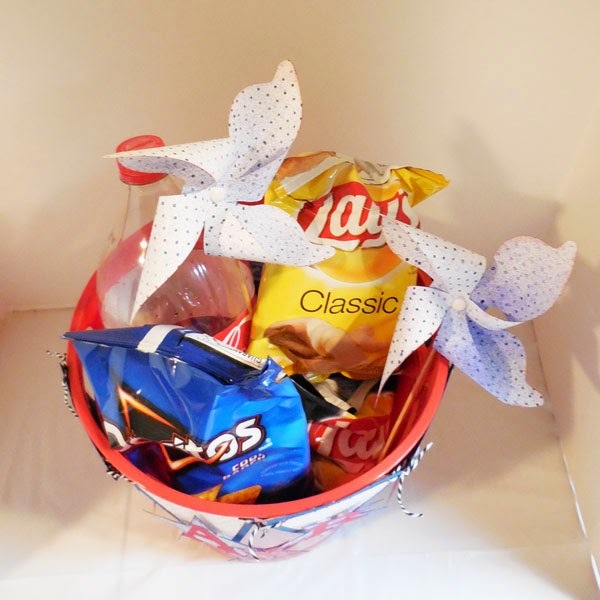 Mix the pinwheels amongst the goodies in the party bucket and you are ready to go. 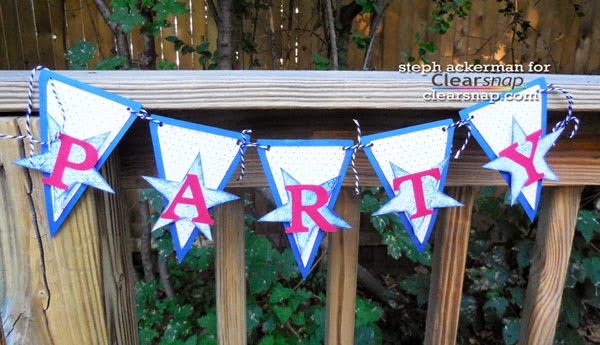 What party creations will you create today? Good morning everyone, here's a fun mini album that is perfect to showcase all those upcoming summer/vacation photos. 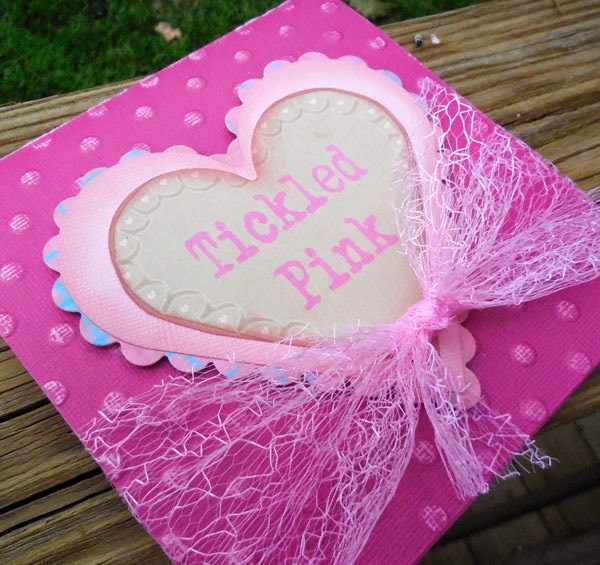 This album is not your usual album - it contains pages made of chipboard, corrugated board, felt, canvas and acrylic. 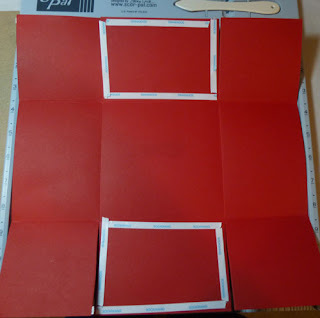 The possibilities are endless because you can use this album as it comes, or take it apart and rearrange it. 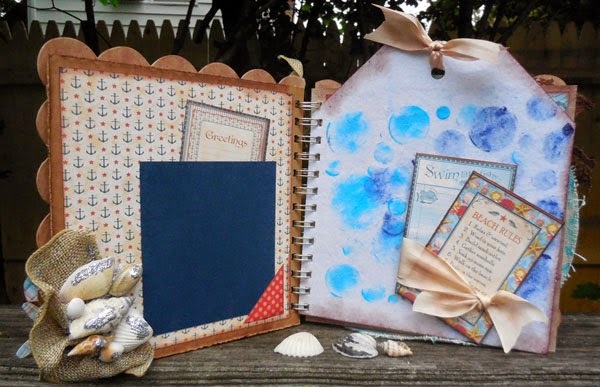 The Graphic 45 By the Sea collection was the perfect paper to use with its bright colors, lots of designs and different sized elements that work well together. Since I was adding fussy cut elements to the front cover, I first inked the chipboard with ColorBox Chestnut Roan chalk ink. 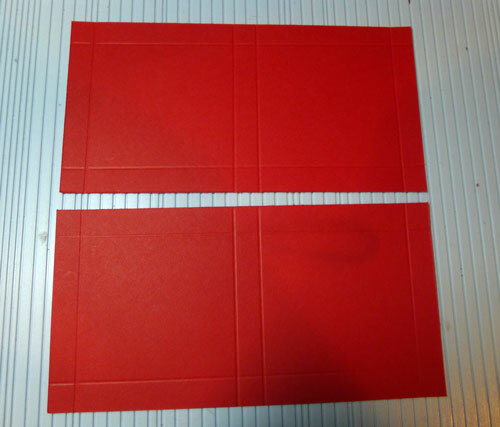 Three different sheets of paper were cut apart and reassembled on the front cover. There are lots of spaces for photos. I cut apart one of the squares from the Window Die cut to create triangles which I inked and then added rub-ons on one. 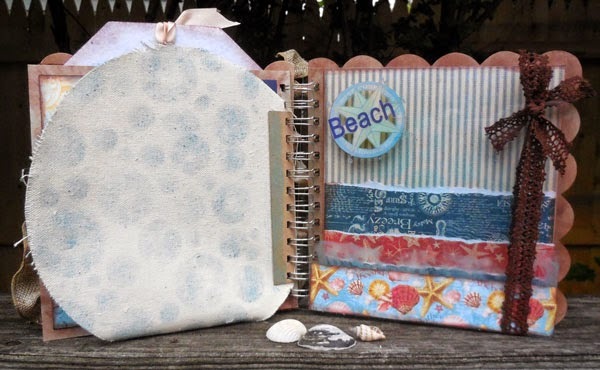 The next page has real shells that were nestled amongst some May Arts burlap ribbon and then glittered. 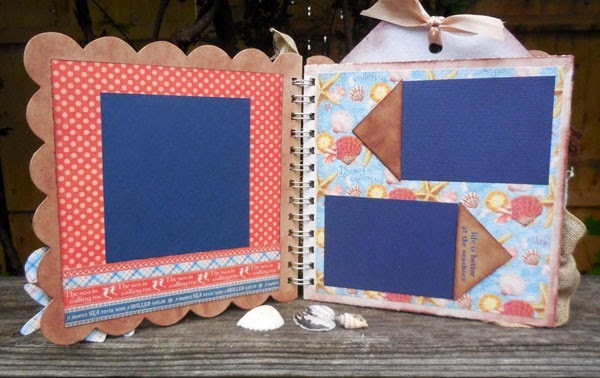 The felt page was painted with Art Anthology's Honolulu Blue Sorbet and Aloha Velvet paints through a ColorBox Art Screen. 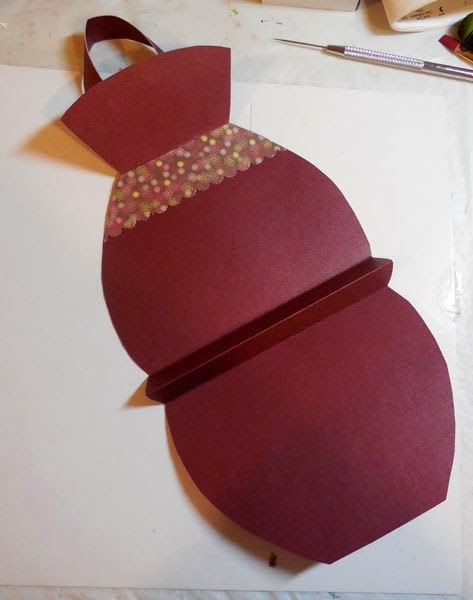 I mixed the colors together, then added die cuts and ribbons. 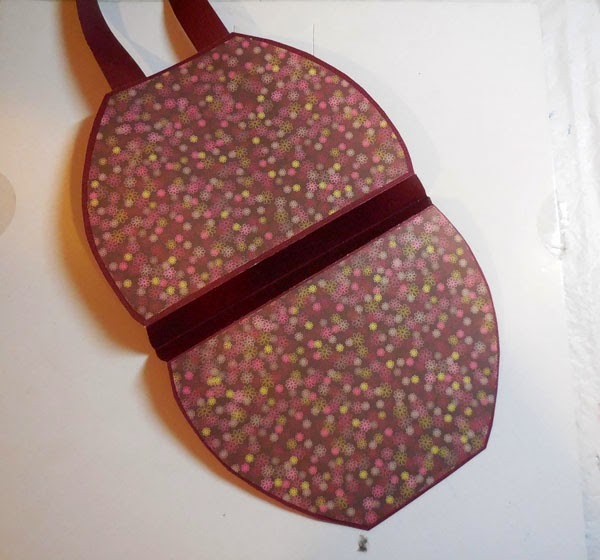 The reverse side of the felt page reused the ColorBox Art Screen this time with Art Anthology's Waimea Bay Colorations Spray as I wanted just a hint of color. 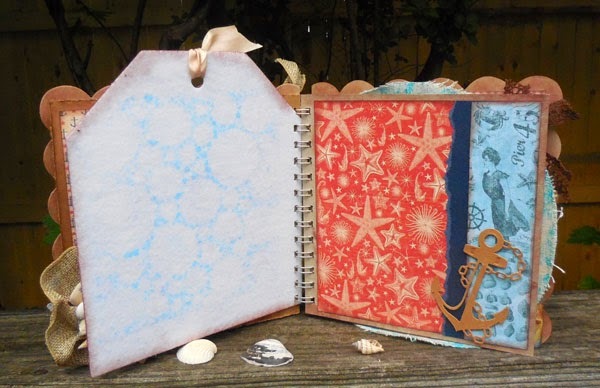 A Spellbinders anchor was die cut and added to the next page because it worked well with the selected papers. The lighthouse scrap was left over after I fussy cut the front cover. 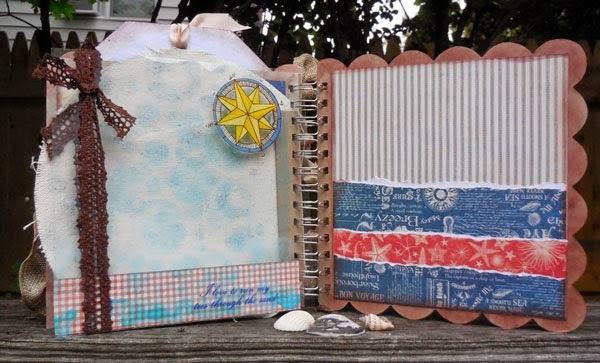 I love the colors and the elements so I fixed it, mixed it with cardstock and other papers to fit the album. 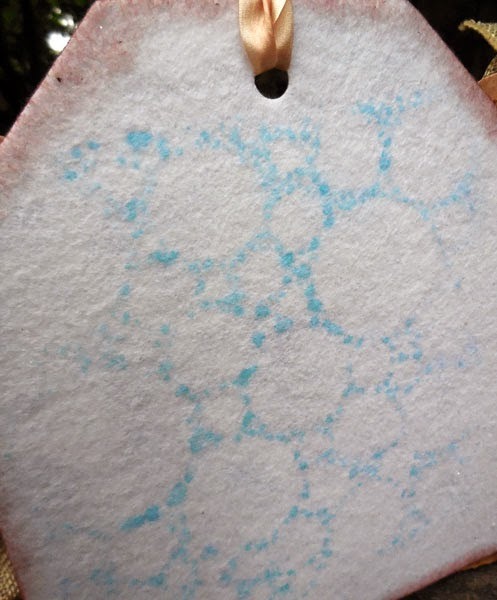 The next page is a large canvas circle which I lightly painted through the ColorBox Art Screen with Art Anthology's Honolulu Blue Sorbet and then Aloha Velvet was painted around the edges. 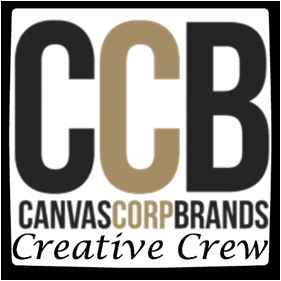 I purposely frayed the canvas. 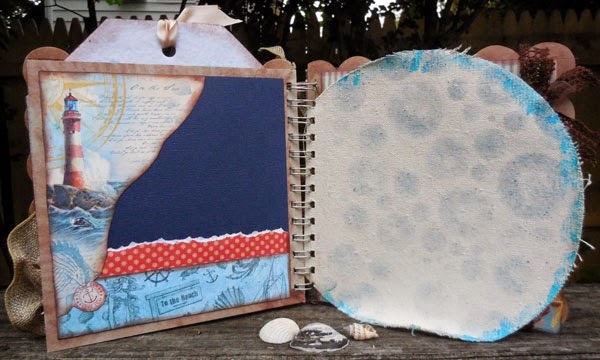 The acrylic page was spritzed with Art Anthology's Waimea Bay Colorations, several rub-ons were added and some May Arts ribbon was tied around the page. 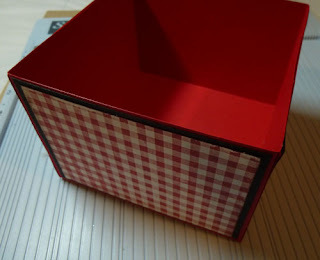 A small strip of pattern paper was added to the bottom and Aloha Velvet paint was used as the adhesive. 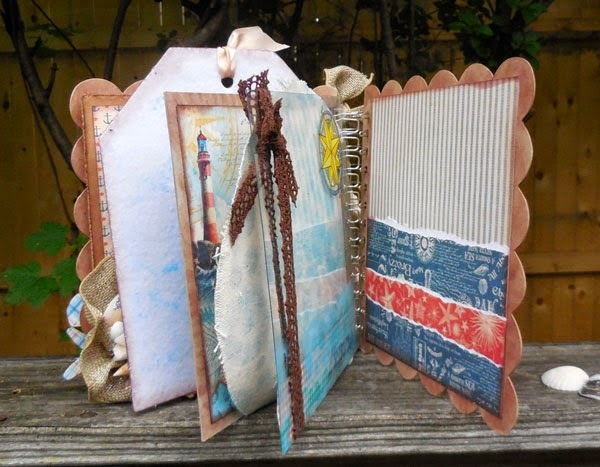 The final page is a pocket page that can hold all the treasures from your trip or additional photos. I didn't want to decorate the back page so I chose to paint it with Art Anthology's Chocolate Sorbet paint creating a white-wash effect (only it's brown!). Hi everyone, I'm using some awesome stamps today from Rubber Dance. 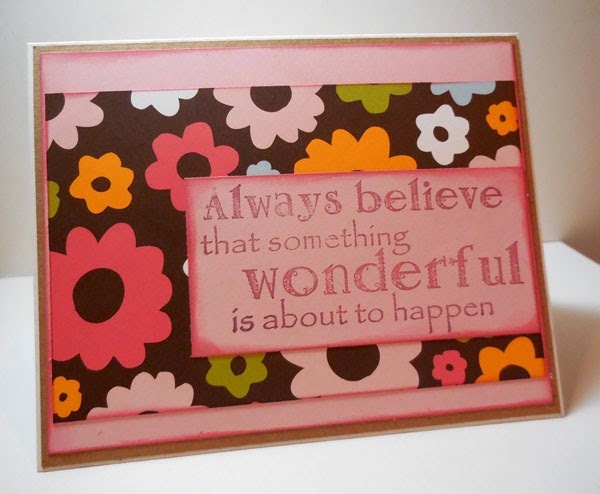 I love creating larger cards (approximately 5" x 6 1/2") and this sentiment is extra large and works perfectly on my card. 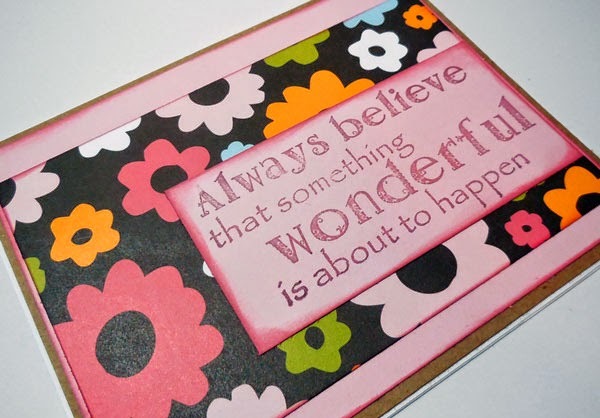 This sentiment is #SEW1-M Something Wonderful, a stamp set that consists of 9 very different stamps in a variety of sizes and fonts. To see more of the stamps available, visit the Rubber Dance store. For more inspiration, please visit the Rubber Dance blog. 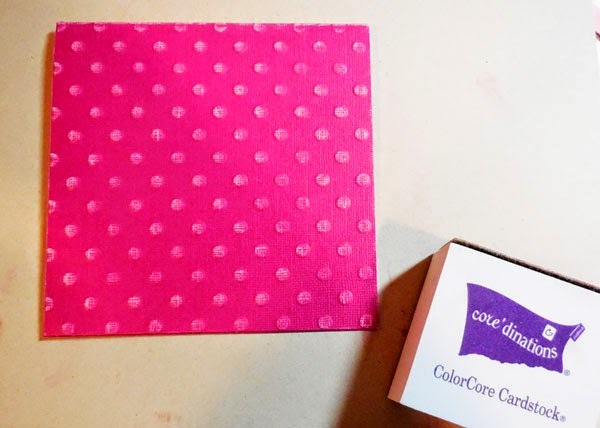 I recently received some awesome Core-dinations cardstock called Tillie Dot Spotted. 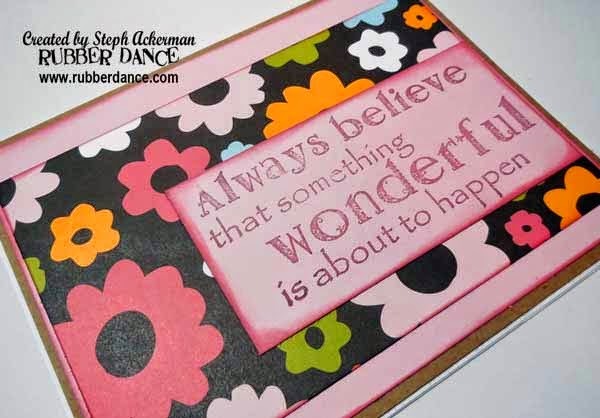 I created a 5 1/2" square card and, using the Core-dinations sander, I lightly sanded the embossed dots. 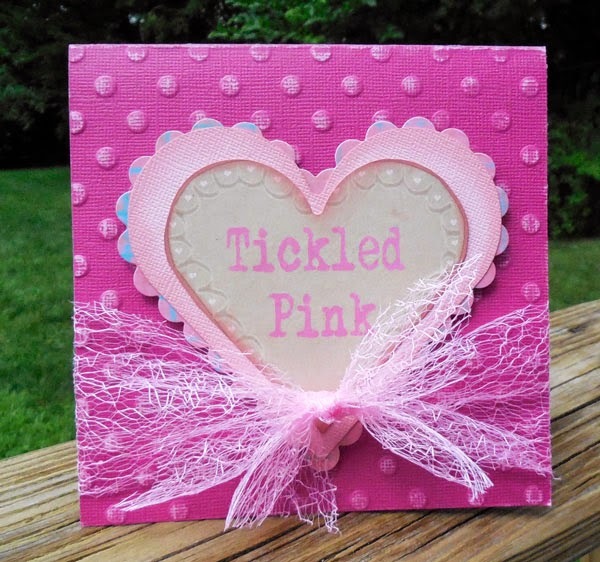 I tied some pink May Arts Mesh ribbon around the card. Wouldn't this be great to announce a new arrival? Hi everyone. 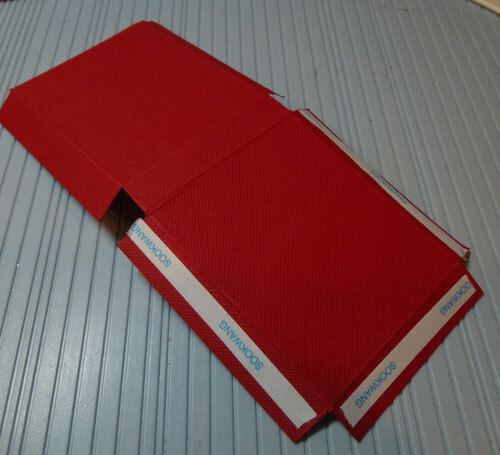 It's Wednesday and that means its time for a new challenge at Mark's Finest Papers & Stamps. This week's Simple Salutations Challenge 112 is favorite school subject. 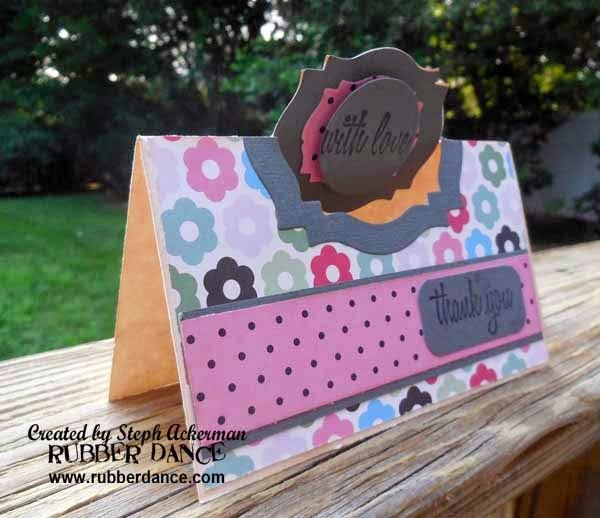 I love art so I chose the Art Works stamp set with some fun pattern paper from Karen Foster Designs. 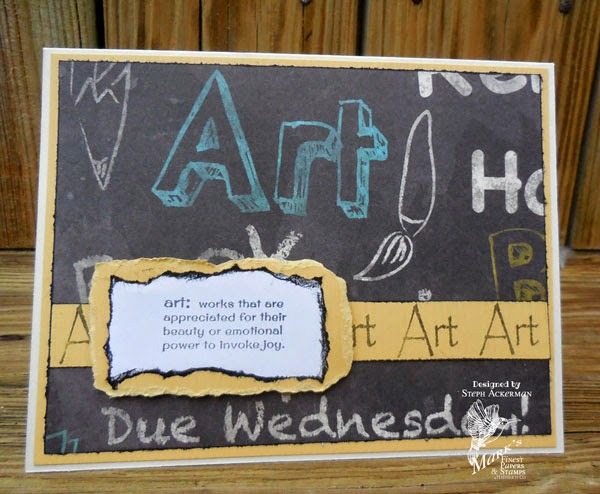 I repeatedly stamped "Art" across the yellow strip and adhered it in place. 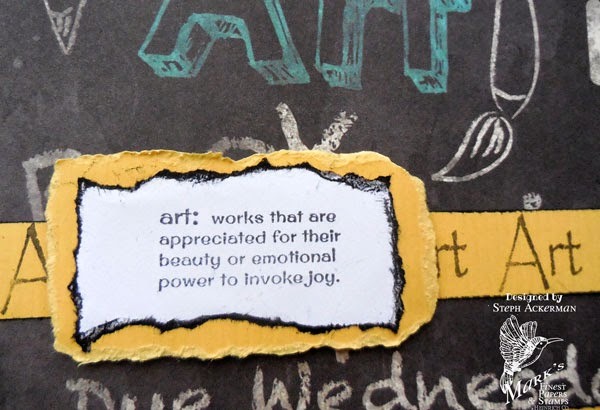 The Art quote was stamped in black, torn and then matted with torn yellow cardstock before adhering across the strip. It's a new challenge at Cornish Heritage Farms, and Iris has asked us to create anything BUT a card. 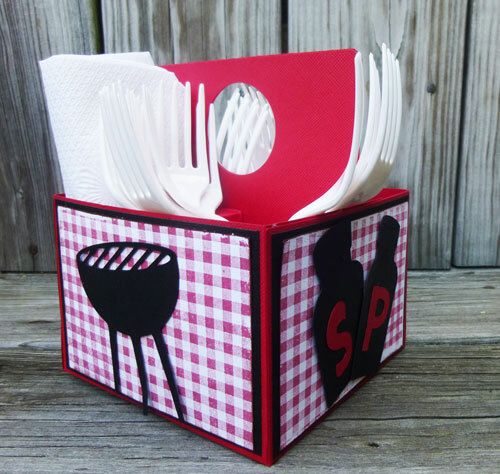 I created this Picnic Basket using the Gingham Backgrounder with Clearsnap Red Barn Chalk Ink on white cardstock. 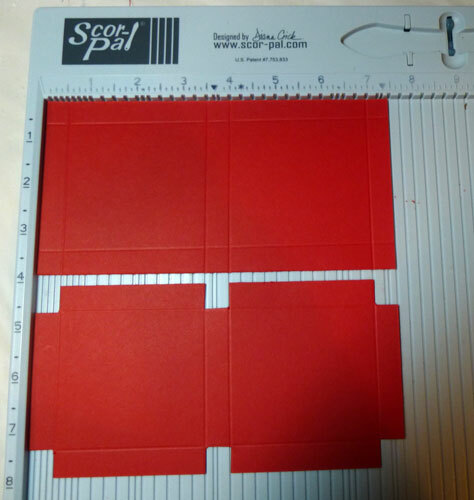 Align 12" x 12" cardstock on Scor-Pal and score at 3 1/2" and 8 1/2"
Rotate and score at 3 1/2" and 8 1/2"
Mat panels with black cardstock cut to 3 1/4" x 4 3/4"
Cut 2 pieces of red cardstock 5" x 8 1/2"
Align the 8 1/2" edge to the Scorpal and score at 2 1/2"
To create the inserts, cut 2 pieces of cardstock 3 1/4" x 7 1/2"
Rotate and score at 1/2", 3 1/2", 4" and 7"
Fill with party gear and enjoy. Hi everyone, it's time to showcase stamps from the Rubber Dance. 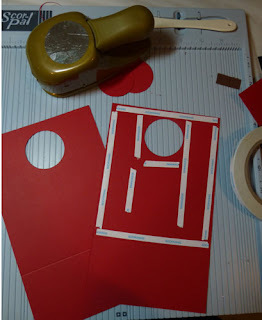 I am loving these red rubber stamps. 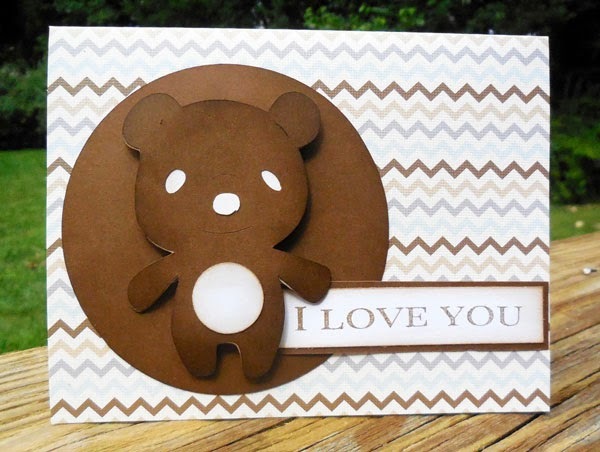 Using dies from the Stamp Doctor and Spellbinders, I've created a very different shaped card. The sentiments are from #JNEN-2E. 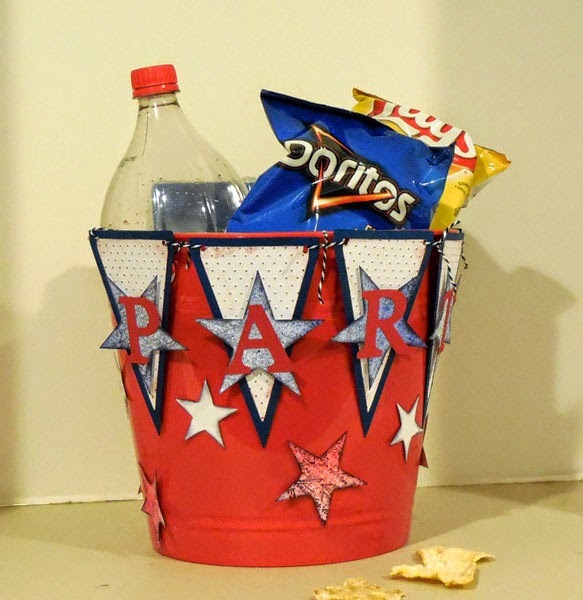 Hi everyone Scor-Pal is celebrating the upcoming school year with lots of fun back to school projects. 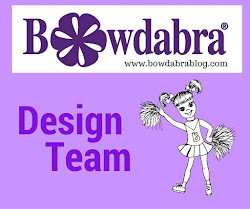 Today I'm sharing a project I think any girl would love to use for school. 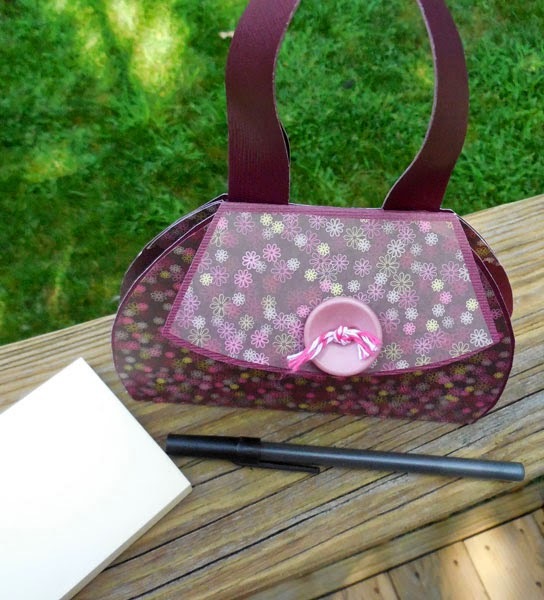 Add a post it note pad inside with a pen or pencil and note taking is now a breeze. Using a template I created, I cut the cardstock and the coordinating pattern paper. 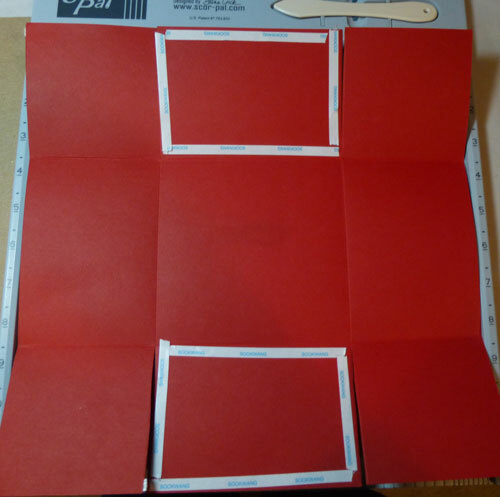 Score 3 lines in the center of the cardstock and then mountain/valley fold. Cut the pattern paper into 2 pieces. 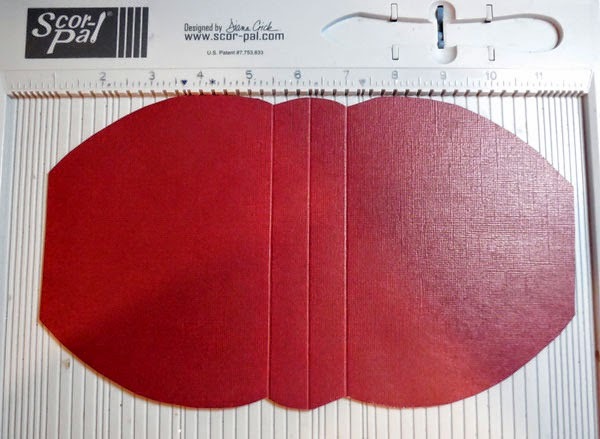 Fussy cut the pattern paper so it is slightly smaller than the cardstock. 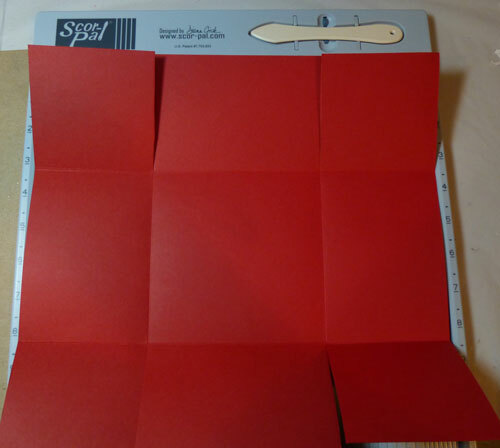 Adhere it to the cardstock. Create the handles from a 12" x 1 3/4" piece of cardstock. Score the length and fold in half. 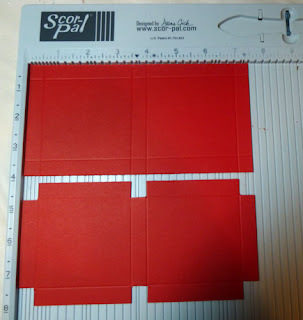 Add Scor tape down the center and adhere together. 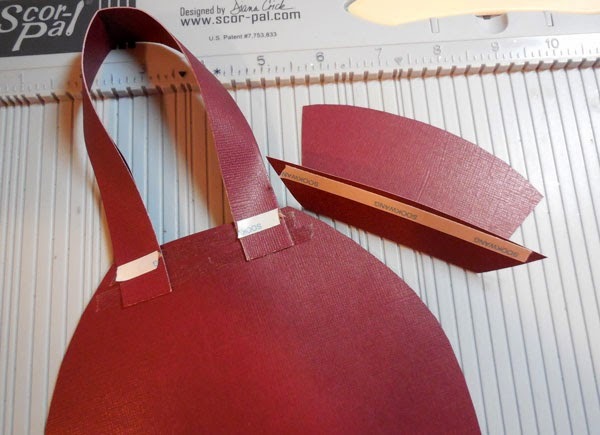 Add Scor tape along the back edge and add the handles to the purse. 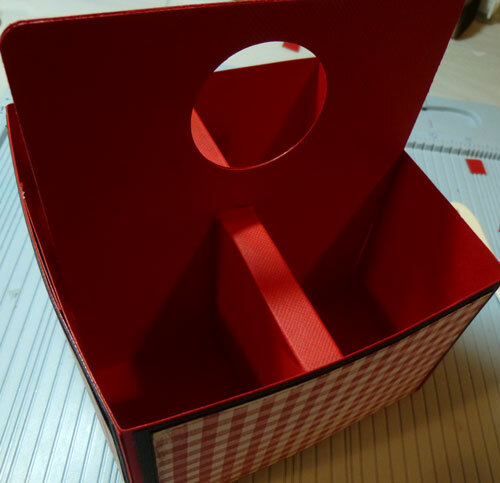 Create a front panel and adhere it to the inside back on top of the handles. 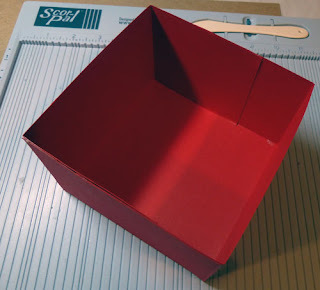 Add pattern paper inside to cover the added panel. Punch along the bottom edge for some visual interest. Add a button to the flap and you are done. Just adhere the post it note stack inside. 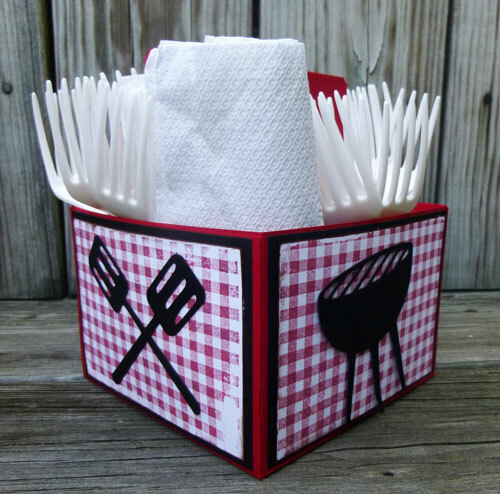 I'm thinking this would be a fun gift for a teacher - I think she'd love it, don't you? Hi everyone. 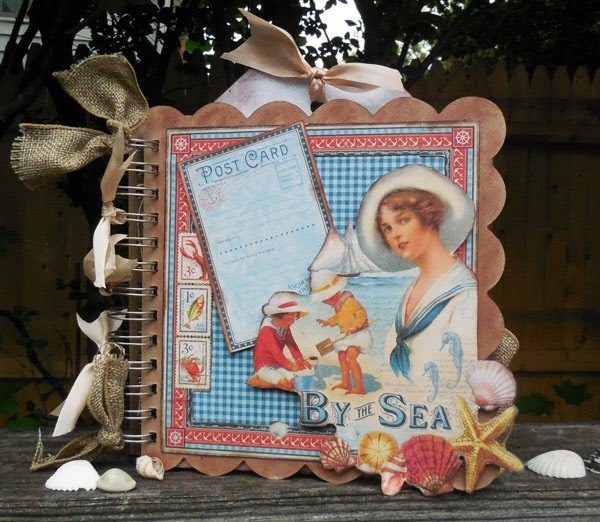 It's Wednesday and that means its time for a new challenge at Mark's Finest Papers & Stamps. This week's Simple Salutations Challenge #111 is about bears. I die cut the little guy using my Cricut. 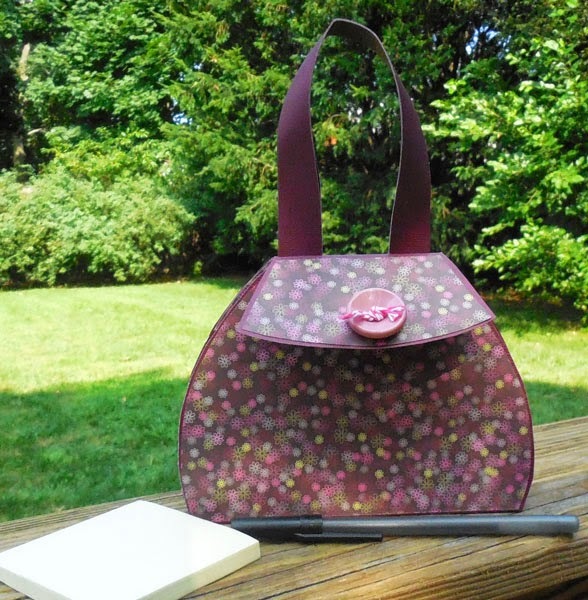 The sentiment is from the Roses 2014 stamp set - so many stamps to work with. 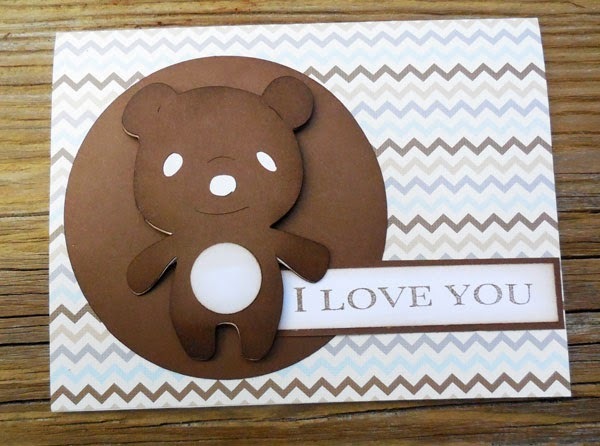 Because I was using a premade card, I needed little embellishing.